Thank You Santa Rosa Quilt Guild! Each year the Santa Rosa Quilt Guild makes and donates quilts and baby caps to organizations serving people in need of comfort and support. Our donation quilts start with fabric from a member's private stash or from fabric that has been generously donated to the guild by members or others. Guild fabric is available at each meeting in packages of pre-cut squares and border fabric for construction of baby and toddler quilt tops. 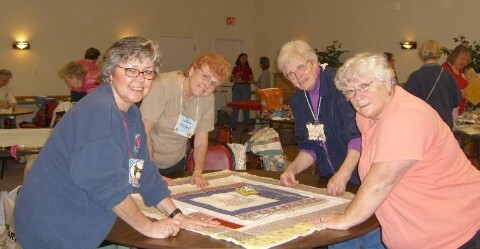 Three times each year the guild holds "Quiltathons" to prepare the quilts to be donated. Guild memebers are encouraged to participate in the Quiltathons by helping with the many tasks involved including basting, sewing, machine quilting and sewing labels. Members may bring their sewing machines but there are also many tasks to do by hand as well. Quiltathons are lots of fun! 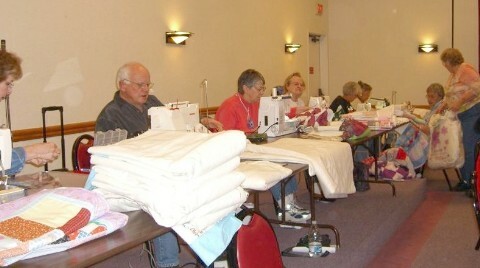 Between Quiltathons, members may take quilts home to finish. "Fifth Thursday Retreats" at the Luther Burbank Garden Center offer another opportunity to work on the quilts to be donated while visiting with other members in a relaxed setting. The organizations that receive our donations are very grateful and tell us how much the families appreciate and benefit from the quilts we are able to share with them. Thank you to everyone for your efforts in making this possible! Please check out the Community Quilts display board at guild meetings and speak with our chair people for more information. The Community Quilts committee welcomes members' further involvement at any time. If you are making donations quilt on your own, "The Sizes for Community Quilts" lists preferred sizes for various quilt needs. “The Steps for Community Quilts” includes instructions for each step of assembly. Click on the links below to download instructions for knitted and crocheted baby caps and easy baby quilts.